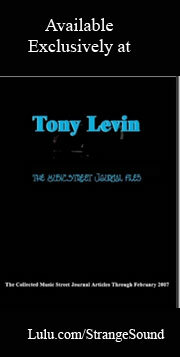 I know that many of the people who read Music Street Journal are progressive rock fans – and some of you are prog purists. 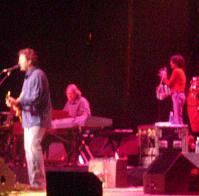 So, you are probably asking why we would review a Vince Gill show – and more importantly, why you should care? Well, before I get into the core of this review, I’m going to address that issue. Let me just say that (as far as I know) there is no musical genre called “progressive country.” If there were, it seems obvious that Vince Gill would be one of its key players. Indeed, Gill’s music shares something big with progressive rock. That’s a nature that transcends borders and labels. He not only flirts, but often run full on into such diverse musical styles as hard rock, the blues and even jazz. Certainly this is a similar sense of adventure to the prog bands of the 1970’s who were incorporating classical, jazz and world elements into a rock music idiom. For you prog heads out there, I also find a little story interesting to relate – and it shows that Gill is certainly aware (if not a fan) of progressive rock. 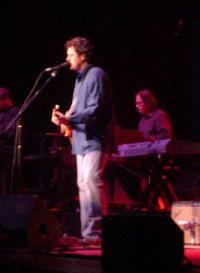 In the course of introducing one of the tracks Gill spoke about the country singer John Anderson. Well, he went on to add, “the country singer, not the singer in Yes.” A bit later along in the course of his story he said something along the lines that he’s always thought a “swinging” country album of the songs of Yes might be interesting – and proceeded to throw out a couple lines of “Roundabout.” So, trust me here, Gill might be country, but he is also a musician who even those who are prog purists should give a chance. Now, with that out of the way, let’s delve into the heart of Gill’s performance. I have to say that of all the concerts I’ve attended over the years – and it’s a lot – this was one of the most entertaining shows I’ve ever experienced. Not only were Gill and his band (he had a 15-piece outfit with him) talented, but Gill came across as a genuine, humble and entertaining man. He told stories that were often quite funny. He also tried (and pretty much succeeded) to respond to everyone who shouted out to him from the crowd. I was amazed at his hearing. I’d have to say that these touches of the human side of his musical journey were highlights that added to the show, rather than detracting from it. It gave a greater appreciation of the man and his art, and that allowed the listener to become more fully immersed in the music at hand. And, what about that music? Well, as I spoke about at the onset of this review, very little of it was truly country and nothing but country. More often than not the music was at least embellished with and often fully immersed in other musical styles. This aspect of Gill’s music was shown off in his recent These Days collection. That album is a four CD set that is divided disc by disc into differing musical styles. 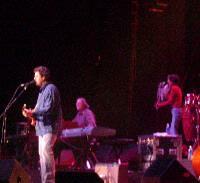 It showed that Gill is much more than “just a country singer” and the concert affirmed this observation. Gill also sourrounded himself with exceptionally talented players. Everyone in the band was spot on, and these guys were just plain tight. While I can’t say that I enjoyed every single sound or phase of the show – the bluegrass stuff fell a little short for my tastes, I can say that this band was on top of their game for the entire performance. I’ve seldom seen a group of musicians as tight as these guys. And there were some rocking moments that were every bit as powerful and inspiring as any true rock show I’ve attended. 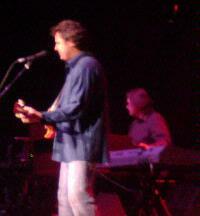 If you have a mind to reach out into country music, give Vince Gill a shot. I have to say that whether you embrace the genre or not, you really should catch this guy live. It’s an experience like no other. Now, if ten years from now there is a genre out there called “progressive country,” be sure to remember who said it first.